The province’s review of regional government is now in full swing. Ontarians have known this was going to happen since last summer, but on Friday, Waterloo Region Chair Karen Redmon and all seven of the region’s mayors met with Municipal Affairs Minister Steve Clark’s special advisors who are guiding the review. 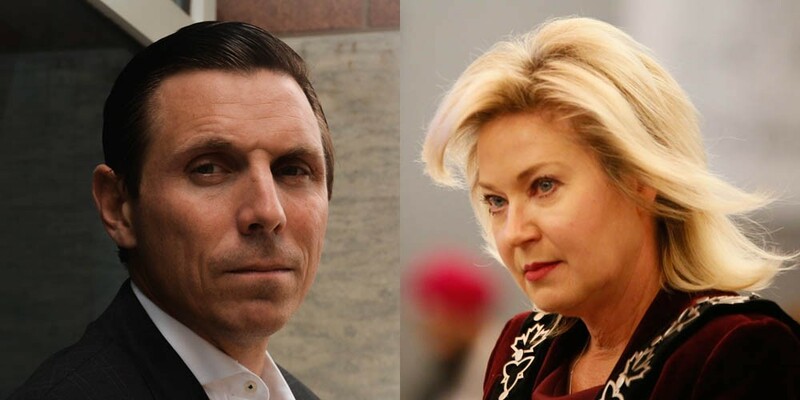 With the prospect of Peel Region also sliding under the province’s microscope, it may soon come to pass that Chair Nando Iannicca, Brampton Mayor Patrick Brown, Caledon Mayor Allan Thompson and Mississauga Mayor Bonnie Crombie will be holding a similar meeting with the ministry. Before any decision is made on the make-up and function of the region, a number of factors will need to be considered. 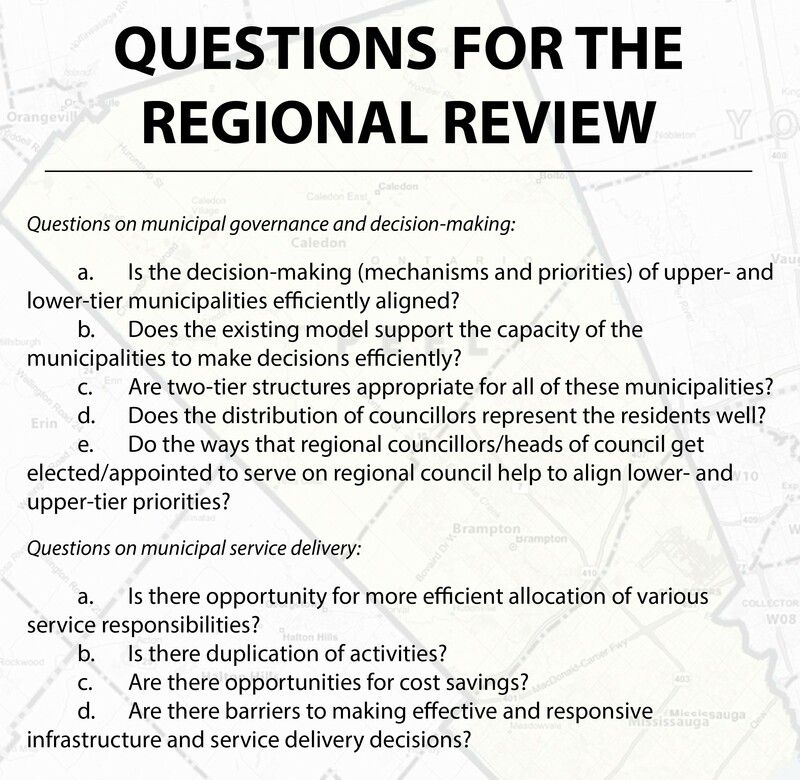 It is no secret that regional governance in Peel has been known to inflame passions among the four. Bonnie Crombie, carrying on her predecessor Hazel McCallion’s legacy, would like a divorce from Mississauga’s partners. 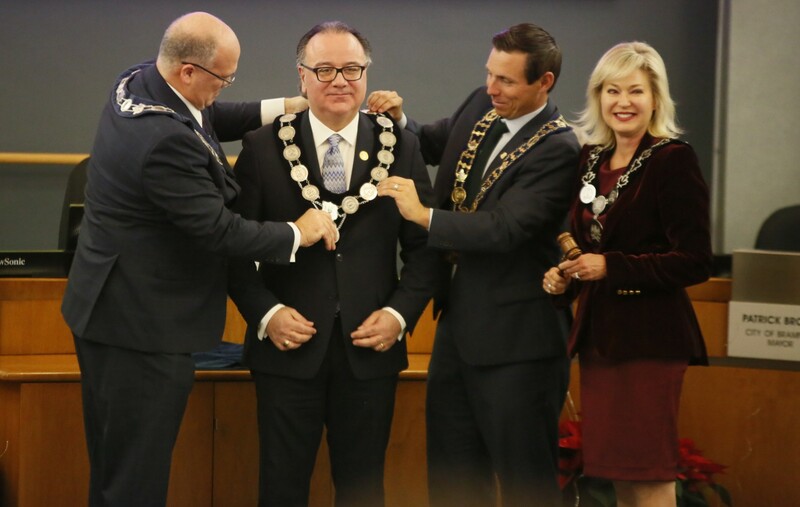 “I believe Mississauga, being the third largest city in Ontario — with much smaller cities and communities being single-tier — that it has always been our desire to control our own destiny,” Crombie told The Pointer after Iannicca’s official appointment. Her support for seceding from Peel could make for awkward and disjointed talks between the region and the province. Iannicca, who previously served as a Mississauga city councillor for 30 years, signalled his willingness to keep the region intact. “I welcome the review. I think they are on the right path for a whole list of reasons. The key is, let’s move forward, let’s have a discussion on what works well, and I’m going to be arguing the Region of Peel works very, very well,” Iannicca told The Pointer in January. Mississauga makes a compelling case for secession from the region. If the city were to leave, Brampton’s neighbour to the south might see a reduction in its costs. According to figures from 2003 (the most recently available), the municipality claimed it would save $32 million annually by restructuring services, such as policing and wastewater, delivered by the region, and could reduce annual overall property taxes by 6 percent if it did not need to subsidize development in the neighbouring municipalities. Mississauga would also be unburdened administratively if it needed to focus only on its own residents without considering how policies affect Brampton and Caledon. Bramptonians and Caledonians who are paying attention, however, would be right to feel nervous about losing their sister city. A divorce with Mississauga could cost Brampton an extra $19 million and Caledon $6 million annually. Property taxes could rise in Caledon by 13.3 percent and by 7 percent in Brampton, already stretched by sharp tax increases. Former Brampton mayor Linda Jeffrey butted heads with Crombie over the subject during their time together on regional council. Jeffrey, on numerous occasions, pointed out that Brampton contributed significantly to Mississauga’s development since the creation of the region in 1974. Jeffrey estimated in 2016 that Brampton had contributed roughly $4.8 billion to the region since its formation. “Brampton was there to help Mississauga as they grew and built out. Now, as infrastructure investments are needed in Brampton, our largest partner wants to cut and run,” she once said. The city, in the event of a “Mexit,” would need to shoulder the burden of Caledon’s development for years to come. Peel’s rural heartland, though containing a fraction of the population, has 56 percent of the land mass of Peel and is experiencing a similar rate of population growth — Caledon grew at a rate of 11.8 percent between 2011 and 2016, while Brampton grew by 13.3 percent. City services, housing and infrastructure would need to catch up to accommodate the newcomers moving north of Mayfield Road. One option for Caledon, suggested by Crombie, is for the town to have its own divorce and merge with Dufferin County — which consists of more similarly sized towns such as Orangeville, Melanchthon and Mono, among others — leaving Brampton as a single-tier municipality. “Caledon has 60,000 residents. Our smallest wards have more than 60,000 residents. It's an inequity,” Crombie said in 2016 when comparing Caledon with Mississauga. The town may have a strong motivation to separate from the region. In June 2015, Caledon regional councillors walked out of the chamber to protest a motion by Mississauga Councillor Carolyn Parrish that would have allowed Brampton and Mississauga to take over planning for the rural community. The act broke quorum, causing the motion to fall apart as well. Months later, with the support of Brampton and Mississauga councillors, much of Caledon’s decision-making on planning issues was shifted to the region. Caledon has just five councillors at the regional table, which puts it at a disadvantage in any regional dispute compared to Brampton’s seven councillors and Mississauga’s 12. It could gain power by merging with its neighbours to the north. With 70,000 residents, it would be the most populous municipality in the county and would be able to encourage some growth to shift to smaller townships, such as East Garafraxa, where the population has been declining. Those are not the only options, though. Some officials, namely the late Mississauga city councillor Jim Tovey, have advocated for the idea of a City of Peel, where all three municipalities are merged into a supercity larger in area than Toronto. The population of this hypothetical city, close to 1.5 million, would make it the third-most populous city in all of Canada, knocking Calgary down to fourth, with 1.2 million. “Don’t do anything hasty, but I want to see a business case that looks at the issue from the top down and the bottom up,” Tovey said in 2016. He elicited much laughter when he made the suggestion in Mississauga City Council. What would be the advantage of amalgamating the three cities? It would create a single-tier municipality offering robust services under one umbrella. The disadvantage? It’s hard to say now which parts of the sprawling urban/rural supercity might eventually begin to feel left out of the conversation. But the forcibly amalgamated Toronto offers a hint, in the resentments that linger in suburban parts of the city such as Scarborough 20 long years after the province ended their autonomy. 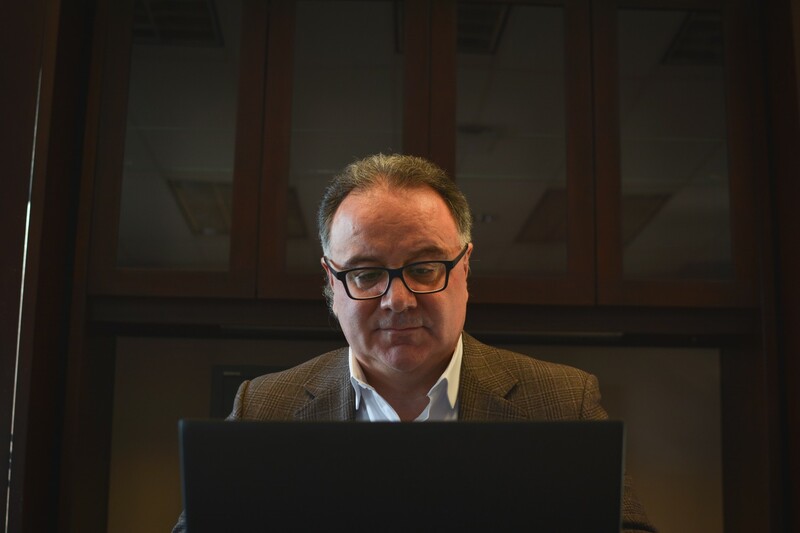 It is not yet known when Iannicca and company will meet with the province, but when they do, they’ll have a range of options — and perspectives — to present to the Ministry of Municipal Affairs.